In our opinion, this is the best book of prophecy in print! Covers the Great Catholic Monarch, the Holy Pope, and the period before Antichrist, with excellent, excellent commentaries by Dupont. It seems totally impossible that so many prophecies from various countries and different centuries should all speak about the same time and the same historical characters. Shows the coalescing of Saints' prophecies on our times and our immediate future. 125 Pp. PB. Yves Dupont was born at Paris in 1922. While receiving his education from the College de Royan, he decided to begin prophetical studies, and correctly predicted the defeat of the French by the Nazis near the River Loire. 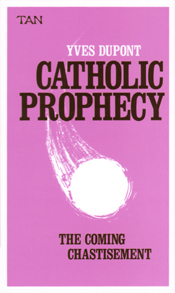 He later published World Trends, a Catholic periodical, in the 1960s, and released Catholic Prophesy: The Coming Chastisement in 1970 through TAN. Mr. Dupont has also stated that he has sufficient material for four similar books.